Many people choose to record wonderful moments with a HD camcorder for its great video presenting ability. How to edit Panasonic, Sony, Canon MXF files in Premiere Pro CC/CS6/CS5? If you’ve got a Sony XDCAM/Panasonic P2/Canon XF camcorder, you may plan to get a software that could be better to transcode the MXF video files to Adobe Premiere Pro CC/CS6/CS5.5/CS5 for further editing on Mac or Windows. Premiere Pro doesn’t suport MXF files importing? Sometimes you will find import the .mxf video to Premiere Pro (CS3, CS4, CS5, CS5.5, CS6, CC), and the video plays well, but there is no audio imported with the clip. Should the .mxf contain an audio track, and Premiere Pro doesn’t recognizing it? Yes, Premiere Pro can’t get the original audio from MXF files. In addition, the Premiere Pro can’t import many Canon, Sony and P2 recorded .mxf video files. Even if you can import video files， you can’t get the output video succeed. You will get an ERROR when Premiere Pro rendering the .mxf files. How to import Canon/Sony/Panasonic MXF to Premiere Pro for editing without any video or audio problem? To handle the limitation of supporting MXF file format for Premiere Pro CC/CS6/CS5, we need to use the professional transcoding software to convert MXF format to Premiere Pro compatible formats, like MPEG-2 and H.264 video. MXF to Premiere Pro Converter is your best choice. Once you convert Canon/Sony/Panasonic MXF files to H.264 MOV/MPEG 2 MPG/WMV using MXF to Premiere Pro Converter, the Premiere Pro will can read the converted MXF’s video and audio. You can edit video and audio with Premiere Pro freely. Don’t worry about losing quality by transcoding MXF to H.264 MOV for Premiere Pro with this best MXF to Premiere Pro Converter. We compared the original file with the converted files, the comparison showed us there was absolutely no discernible difference. Free download MXF to Premiere Pro Converter trial version. How to transcode MXF to H.264 MOV for Premiere Pro CC, CS6 and CS5? Install and run the best MXF to Premiere Pro Converter, and then click “Add files” button to load MXF video files to the top MXF Video Converter. MXF to Premiere Pro Converter offers optimized formats preset for Adobe Premiere Pro. For transcoding MXF to H.264 MOV, please click “Format” menu firstly and then follow “Editing Software > Adobe Premiere/Sony Vegas MOV (AVC) (*.mov)”. You can edit H.264 MOV video files in Premiere Pro CC/CS6/CS5/CS4 smoothly. As you see, you can choose WMV and MPG as output format here. 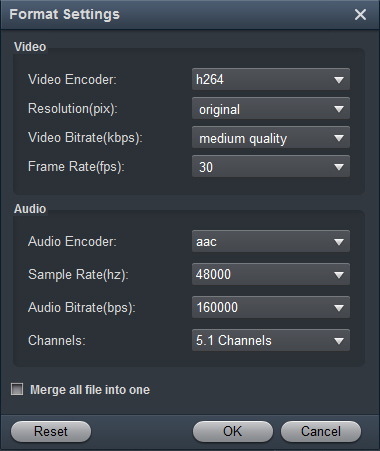 Tip: You can click “Settings” to adjust video size, bit rate, frame rate, sample rate and audio channels. For example, if you want to get a 1080P footage, you can input 1920*1080 into video size column. Click “Convert” button to start Panasonic, Sony and Canon MXF to Premiere Pro editable video conversion. After MXF to Premiere Pro editable video conversion you can click “Open” button to locate converted files for importing into Premiere Pro (CS3, CS4, CS5, CS5.5, CS6, CC). Now, you can edit MXF video files in Premiere Pro freely. How to import Panasonic P2 MXF to Adobe Premiere Pro? Premiere Pro CC introduced deep support for Avid’s DNxHD file format wrapped in Op1a MXF containers. To the uninitiated this may seem fine for cross-NLE workflows but there is an issue with importing these files into Avid Media Composer. Op1a MXF allow a user to wrap audio and video tracks together in one file while Avid, on the other hand, relies on OpAtom MXF which is a multi-file format that splits video from audio and connects them with metadata. Acrok MXF Covnerter is a good idea to solve this problem. In order to import MXF to Adobe Premiere Pro, you can convert MXF to MPEG-2 HD or MP4 HD to import MXF files to Premiere Pro CC/CS6/CS5/CS4 for edit. I like its batch convertion function. When the convertion starts, I can go out for a walk and get what I want when I come back. All I can say is… if I were ever to write a .mxf converter app, it would look like this. Don’t see how it could any more user friendly. TONS of features, extremely powerful, super easy to use… what else is there? Kudos to the development team! The MXF is a “container” format which supports a number of different streams of coded “essence”, encoded with any of variety of codecs, together with a metadata wrapper which describes the material contained within the MXF file. For edit all the MXF recordings with Adobe Premeire Pro program, you need to transcode .mxf files to Premeire Pro supported foramts. Acrok MXF Converter for Mac is the beneficial application designed to help edit MXF on Premiere Pro CC/CS6/CS5 with ease. With this perfect MXF to Premiere Pro Converter, you can convert MXF to H.264 MOV, MPEG MPG or WMV-1 WMV for better editing in Premeire Pro. And you can convert MXF to MP4, AVI, WMV, MOV, FLV to play MXF file on all Android and Apple Tablets and smart phones. I just wanted to say that my husband’s camera does videos in .mxf format, and while we don’t record videos very often sometimes we do a bunch at once. Your software has worked perfectly, too! Last time I needed it was three months ago, and I’d lost my original install file since then. So I just logged back in, redownloaded it, and re-got my registration code. So easy! I really appreciate it that you all make a great product and make it easy for users to get what they need from your website to get on with the converting, and I reckoned you should know that you’re doing good stuff. You need to convert MXF to H.264 codec MOV format for using MXF files in Adobe Premiere, you can try freeware Handbrake, I have tested converting a short .mxf file to a .mov file using HandBreak. It works well on quicktime and iMovie. 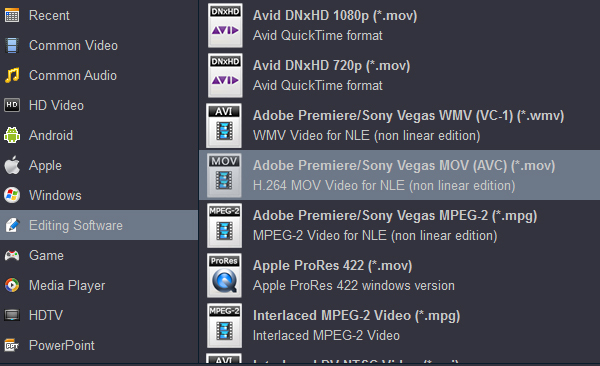 Handbrake also supports to convert video all nearly all the formats. I think it may be your best selection for video converting. 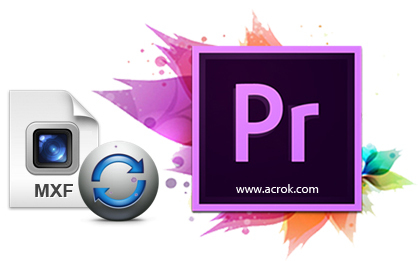 With Acrok MXF Converter, you can import and work with DNxHD .MXF files in Adobe Premiere Pro CC, CS 5.0/5.5/6.0, Adobe After Effects CS 5.0/5.5/6.0, or Adobe Media Encode CS 5.0/5.5/6.0. And this MXF file conversion software is a free MXF video player. With it, you can play Canon, Panasonic, Sony, JVC, BlackMagic, RED, Ikegami MXF footage freely. This Mac MXF conversion software runs on a pretty high amount of system resources and quickly finishes an encoding job without causing us any difficulties along the way. The image and sound are maintained at a very good quality in the output files. I highly recommend this tool to all users. This is a great piece of software easy to use with great results. It allows me to edit videos before converting, it is so powerful. I like it. I will recommend Acrok MXF converter to all my friends. I’ve recently entered the world of video/music file editing. Getting through the various programs available was difficult — some are simply too hard to master. Acrok MXF to Premiere Pro Converter came to my rescue. It’s a very well thought-through piece of software. I’m using a canon XF305 and premiere pro CC on a Mac Pro. I would like to know the best workflow so I can get footage from the camera, into premiere so I can start editing. If you copy the content of your memory card onto your harddrive before you import it, be sure to copy everything in the same folder structure, to ensure correct import. Have you tried the media browser inside Premiere or just the import command? 1. 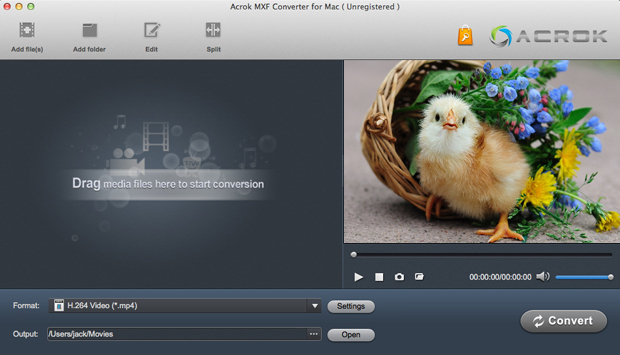 Convert your Canon XF305 MXF to H.264 MOV via Acrok MXF Converter for Mac. 2. Copy just the MXF files from the memory card to the computer and import those files into your project. Premiere Pro will create PEK files, but not conform them. You will have to arrange them manually (join the spanned clips yourself). Even with this method the audio sometimes disappears and you have to restart Premiere Pro to get it back. 3. Use the Canon XF Utility to create a single MXF file of your spanned clips on the memory card and import the new file into the project. PPr will create a PEK file and not conform. I have not lost the audio with this method (yet). I prefer method 3 even though it takes a little longer to create. I can name the file to whatever I want. Keeping all the spanned clips straight with the default camera naming scheme is difficult sometimes. Regardless of the above methods, once I have the video arranged on the timeline, I’ll render and replace the audio. It’s another added step, but it guarantees the audio won’t disappear.